I was working on an intricate Rocketeer piece (that will probably be a “look at my art because I haven’t written anything new” comic in the future) and didn’t plan to create anything political this week… and then Trump’s hilarious “covfefe” tweet happened. When I read it, the first thing that popped into my head was a group of hooded men in a candlelit basement, praying to a skull on a pedestal, chanting “covfefe”. 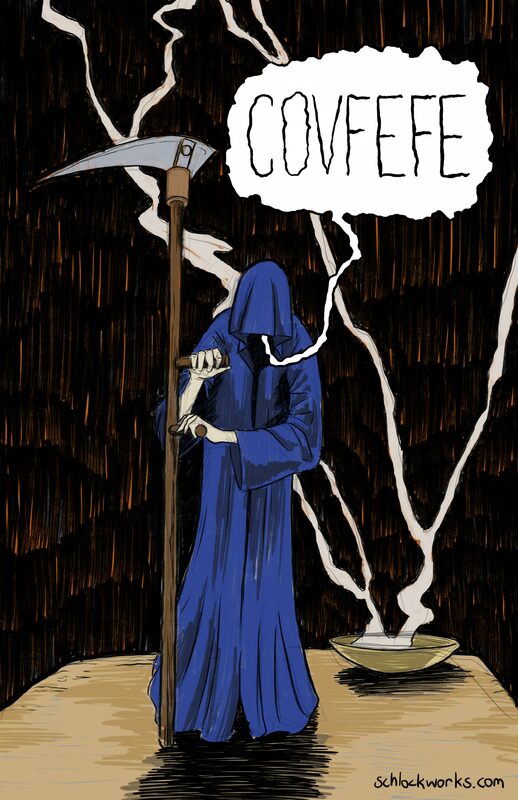 Then that blended into The Hooded One from Jeff Smith’s amazing Bone comic. So there you go. I had a spare hour and decided to roll with my newfound excuse to draw The Hooded One. If you don’t get the reference, you may not be familiar with Jeff Smith’s amazing Bone comic from the 90s. If that’s the case, get the hell off my site, hop over to Amazon, and buy the first volume of Bone. It’s one of the most amazing comics ever published… and that’s not me being hyperbolic. It’s really freakin’ great, folks.